These 0.5% fenbendazole, alfalfa-based deworming pellets, let horse owners feed and deworm in a single step. Just combine these palatable pellets with your ration of choice. On deworming day, replace your usual daily ration with an amount equal to the pellets provided in the handy foil pouch. One pouch will treat 1,250 lb body weight horse in one meal. Controls large strongyles, small strongyles, pinworms, and ascarids. 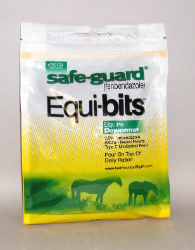 This product is safe for horses, including foals, and pregnant mares.